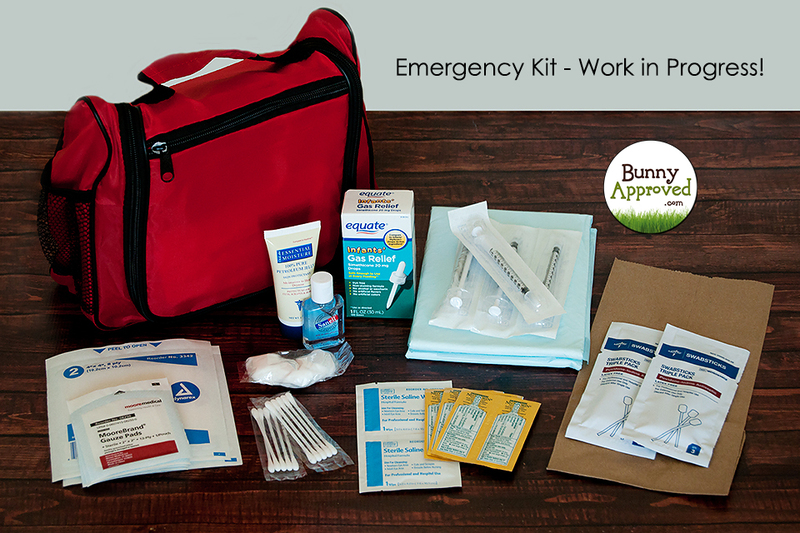 The emergency first aid kit for rabbits is coming along nicely! Figuring out what should be included in such a kit, finding the best products, researching the cheapest sources, and putting it all together has been very time consuming, but we are so excited about the results! It was especially difficult to find a good bag or container that looked like an emergency kit, had enough space, and wouldn’t break the bank. The one we ended up ordering sounded too good to be true, but it’s here now and we almost couldn’t have improved it had we designed it for this purpose! We were able to save money by purchasing in bulk and meeting requirements for free shipping. While the kit overall is not going to be cheap, it will be less expensive than it would be if one person went out and purchased everything on our list on their own, even if we don’t count the time it takes to do so. Water bottles are not included, because doing so would cost an unreasonable amount in shipping and they are easy for anyone to add on their own. Thermometers are rather expensive. We can’t seem to get a bulk discount and there are too many choices, so we decided not to add any to the kit and let everyone choose one on their own instead. There will be lubricant for the tip and a few covers, though! Also, the Furimals Warming and Cooling Pet Mat is going to be optional. Each kit comes with a list of all items included and their expiration dates (if there is one). While we hope that no one actually needs to use the kit, we do want to cover as many catastrophes as possible. An emergency could be due to a natural disaster, an accident, or an illness. Check out the list below and if you think we are missing something important, please let us know! Please note that we are no vets and all items included in the kit are simply collected as options in case of emergency. Bunny Approved is not responsible for the correct use of the products and we recommend that you go over the contents of the kit with your vet. The kit is not a substitute for proper medical assistance. Thanks! We found a good deal on Critical Care and bought in bulk. It’s still not cheap. Yes, we agree! It’s better to be prepared, just in case. We were not planning on adding subQ fluids to the kit. This is something people will have to add on their own if they want it. We looked into Pedialyte, though, and the unflavored version only comes as a liquid, which would increase shipping costs. Great kit. I’ve been putting together first aid kits (human) for some friends and discovered the dollar tree has some amazing supplies, including thermometers and covers. Thanks for the input! The dollar store had a couple of things we needed. Well thought out kit. Is the red tote waterproof? Scissors (regular kind) are good to have in case you have to cut away fur or anything binding wrapped around the bunny. Thank you! No, the bag is not waterproof. These emergency bags are surprisingly expensive and that would have added a large amount of money to each kit. If flooding is a concern, I’d put them in plastic bags. In fact, I’d be happy to add a couple of large freezer bags to each kit. I will research which brand is the most waterproof. Aspirins can be used as painkillers for rabbits as well. This looks amazing, will it be able to be shipped to the UK???? I have been searching for a kit for a while, but they are all aimed at dogs/cats over here. Also roughly when will they be up for sale?